In light of Hugo Chavez’s passing on March 5th, it is useful to explore this ever salient topic and Venezuela’s plentiful hydrocarbon reserves. As usual, any figures cited below come from the BP Statistical Review 2012, unless otherwise stated. Venezuela is, of course, known for its oil reserves, which stood at a staggering 296.5 billion barrels at the end of 2011, compared to Saudi Arabia’s 264.5 billion barrels. In 2009, the Oil and Gas Journal cited Venezuelan reserves as 99.4 billion barrels of conventional reserves. In 2011, this figure was revised to 211 billion barrels. BP figures put Venezuelan reserves at 296.5 billion barrels, of which 220 billion are extra heavy crude from the Orinoco Belt. Extra heavy oil is usually considered to be unconventional oil. However, as mentioned in other blog posts, all oil is not created equal. Most Venezuelan oil is particularly dense and viscous, giving it the appellation of extra heavy crude. The American Petroleum Institute (API) ratings for this viscosity are referred to as API Gravity and measured in degrees. Conventional Oil – Gravity of 20 degrees or more. The lightest crudes stand at about 46 degrees and can be found in Algeria and Malaysia. Bitumen/Asphalt – Gravity less than 4. Natural bitumen is immobile and mostly found in Canada, Kazakhstan, and Russia. Venezuelan oil production has declined from a high of 3.517 million bbl in 1997 (EIA) to 2.72 million bbl in 2011. It is important to remember that, although Venezuela has reserves rivaling Saudi Arabia’s, they are unconventional and require additional expertise, infrastructure, and investment to exploit. As a result, the correlation between reserves and production is not as straightforward as it might appear initially. Venezuela’s national oil company, PDVSA (Span. Petróleos de Venezuela, Sociedad Anónima), came into existence with the nationalization of the oil industry in 1975. Even at inception, PDVSA was intended as a revenue source to fund industrialization and government spending. However, the collapse of oil prices in the 1980s and 1990s and increasing liberalization of the oil industry allowed PDVSA to shed many of its political shackles and focus on producing increasingly larger quantities of oil. With the rise of Chavez to the presidency, the state began reasserting its power over the oil industry. In 2006, exploration and production were further nationalized, resulting in joint ventures with foreign oil companies, who were only allowed minority stakes in projects. PDVSA was mandated to take a minimum of 60% ownership in projects. As a result, PDVSA operates as a monopoly on the basis of politics rather than economics. An example of this limitation is the failure of PDVSA to take advantage of increased commodity prices in the 2000s to increase both reinvestment into wells and oil production in general. PDVSA oil production actually declined while prices increased. The opposite phenomenon occurred in other major oil exporting countries. For example, Saudi Arabian oil production increased by 22.39% from production of 8.809 million bbl in 2002 to 10.782 million bbl in 2008, when prices reached a higher peak than previous high point in 1980. Similar production increases can be found in other major oil producers. According to the CIA, oil exports account for 95% of Venezuelan export earnings and provide about 45% of federal budget revenues. Although PDVSA has been able to fund expensive social programs, it neglects to reinvest windfalls into maintaining existing wells. The EIA estimates that Venezuela must spend at least $3 billion each year to maintain production at its mature existing fields. Coupled with the political risk for foreign energy companies, Venezuela’s infrastructure does not receive the investment or expertise required to maintain oil production at constant levels. Hugo Chavez was not one to hide his political leanings, proudly proclaiming himself a socialist and expanding social spending, subsidies, and programs in accordance. According to the Council on Hemispheric Affairs, Chavez implemented “missions” to reduce illiteracy, provide education, healthcare and housing. According to the report, these initiatives have met with some success, especially in promoting literacy, and reduced poverty by more than half, from 54% to 26%, while extreme poverty fell by 72%. Chavez also implemented fuel and food subsidies, which are both draining to the government’s budget. Government spending reached 45% of GDP in 2012. However, these successes have come at an extraordinary cost, subsidized by oil prices and devaluations, rather than organic poverty alleviation through development of industry. As a result, inflation remains an issue, as does the crime and corruption associated with largess and a weak justice system. Corruption is endemic, placing Venezuela at 165/176 according to Transparency International. In accordance with the resource curse, Venezuela fell victim to capricious government spending, which proved itself unsustainable once oil prices retreated. Debt to GDP reached about 71.9% in 1995 and a restructuring period followed in the late 1990s with IMF loans of 350 million SDR (Special Drawing Rights, essentially used as an internal currency based on a basket of currencies for the IMF) in 1996. One should note that this austerity may have fueled discontent and allowed Chavez to gain power. By 1998, Debt to GDP had reached 40.1%. Debt to GDP stabilized afterward, before surging to 49.3% in 2004 and dropping down to 26.3% in 2009 on the heels of record oil prices. A combination of high oil prices, which are denominated in USD and not cheap Bolivars, and currency devaluation, which occurred in 2002, 2003, 2004, 2005, 2010, 2011, and 2013, helped minimize the debt the GDP ratio. 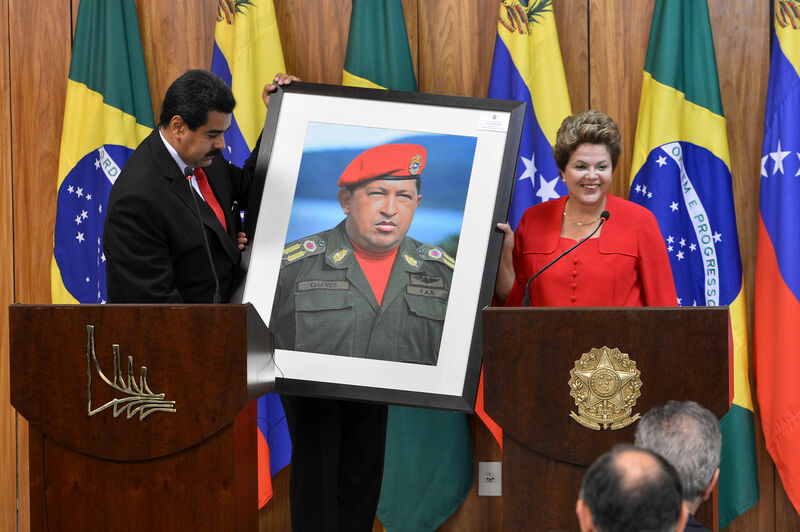 During Chavez’s presidency from 1999 to 2013, the Bolivar has been devalued by 992 percent. Even with such a cheap currency, Venezuelan exports outside of the energy sector are virtually nonexistent and the country remains dependent on imports and plagued by shortages. Venezuela has substantial natural gas reserves as well as oil. These numbered 195 tcf or about 2.7% of the world’s proven reserves. However, the country only produces 31.2 bcm in 2011, (1.1 tcf) a figure which has remained relatively constant during the 2000s. Venezuela consumed 33.1 bcm in 2011, meaning that it also imports natural gas despite its reserves. As a result of its consumption and production patterns, Venezuela remains mostly insulated from the global gas markets and forgoes a potential source of revenue. Once again, the expertise and capital required to export natural gas would ensures that such a possibility remains years in the future. With such a turn of events, it can be reasonably expected that the political and economic situation will remain somewhat static in the future. PDVSA will remain a political asset intended to contribute to government revenues, which in turn provide subsidies and patronage for the ruling party, the United Socialist Party of Venezuela (PSUV) in this case. Coupled with oil spot prices likely to hover around $100 per bbl, PDVSA may be able to carry on as an ineffective, yet stable, monopoly. Enough Venezuelans remain unsatisfied with the status quo as to merit a tempering of previous policies, but the government still finds itself in a position to increase pressure on opposition forces. Regardless, government involvement in the economy, coupled with growing inflation and uncompetitive exports, high levels of crime and corruption, and a partially dissatisfied populace will force the ruling party to come to terms with the economic reality. Maduro will have to make the politically difficult choice of coming closer to the center and liberalizing the economy, or remain a Chavista and preside over worsening economic conditions and increasing inflation that will further degrade popularity. He already lacks the charisma and authority of his predecessor, leaving him with few options. A sudden liberalization will be very unpopular, especially as many ordinary citizens stand to lose some benefits, while increasing repression or even resorting to violence, puts Venezuela in a very precarious position. Such a situation would likely affect worldwide oil spot prices, if the markets sense an increasing likelihood of diminished Venezuelan production; oil production never occurs in a vacuum. The most preferable development would be a steady, but not sudden, political and economic liberalization that would avoid the ire of citizens losing benefits, but also allow industry, markets, and opposition parties to adjust to the new conditions. Maduro would have to be ready to pay the political costs and compete more fairly with the opposition. Header Image: Image by Agência Brasil – Used under Creative Commons Attribution License. The image may be found here.